“Sarah has the natural ability to disarm an audience of their inhibitions and turn a quiet crowd into a relaxed, giggling mess.” Banter Comedy Club. "Not as funny as me." Her boyfriend. Sarah Iles is an up and coming comedian, who loves to share her stories of being born and bred in South London and being OK with that. 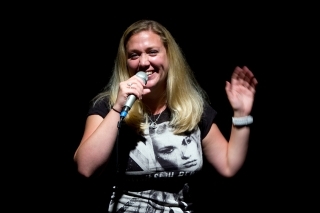 In fact, somewhat proud…..
She can lead the way as a bubbly and engaging host and has a regular MC spot at a comedy night in South London, as well as being a sought after performer at other professional comedy nights, clubs and festivals. © 2019 Backyard Comedy Club.